If there’s one thing us ladies have in common, it seems to be this: We’re always on the hunt for the perfect lip balm. One that is rich in emollients (they boast Vitamin E, shea butter and jojoba oil) and that keeps our lips smooth and protected, especially during the winter months. 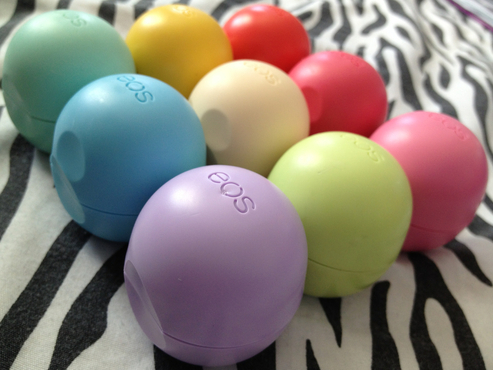 My current favourite lip balms are EOS (Evolution of Smooth). Not only to they moisturize my lips, but they’re virtually impossible to lose because of their round, egg-like shape. They’re also addictive and I just might have one in every colour…oops! They come in yummy flavours, too! 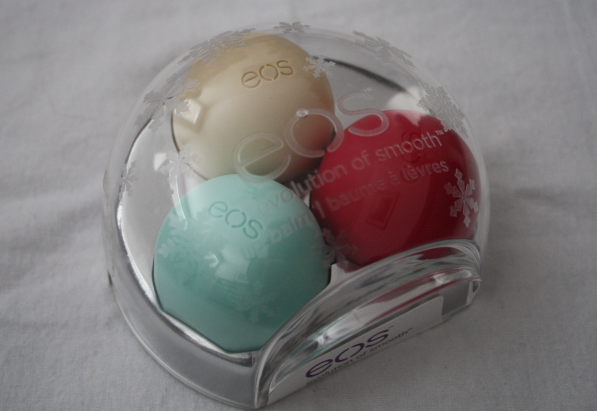 For the holiday season, EOS released a limited edition 3-pack containing Sweet Mint (blue one), Pomegranate Raspberry (red one) and Vanilla Bean (white one). The Sweet Mint and Strawberry Sorbet are my favourites! For days when I need the extra protection, I like putting Vaseline on top of the EOS balms. I find it helps lock in moisture and ensures I don’t have to reapply the lip balm as often. Also great as a base for lipstick. The new 3-pack makes a great gift for Secret Santa, as a stocking stuffer or a little add-on to an existing gift- and they’re affordable!!! Beauty on a budget? Count me in! I use these balms whenever I can- in the morning, after I shower, before applying my makeup, before bed etc. I especially like applying them before bed because I wake up with super smooth lips!